Today I just had to share my latest ‘crafting’ discovery …. water-soluble fabric stabilizer. You may already be aware of it and have probably used it, but I only stumbled across this product last weekend while browsing youtube. I was looking for fresh ideas to use up scraps of fabric and during my search I came across a lady called Jan Tillet making bowls from left over snippets of fabric and threads. Jan’s work is very beautiful and this struck me as a really exciting way to recycle odd scraps and a great way of making something from nothing! The scraps are sandwiched between two layers of water-soluble fabric stabilizer and then machine sewn all over using a free motion embroidery foot, being sure to cross the stitching over and over again to link it all together. 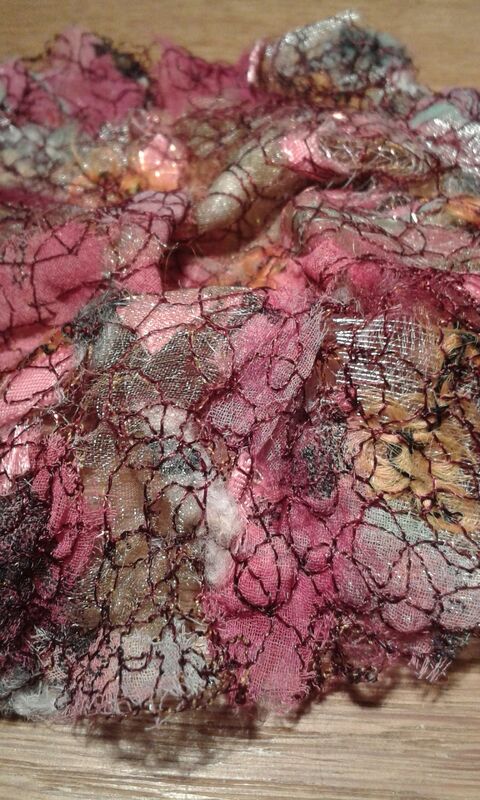 Once the piece has been covered in stitching the stabilizer is all but rinsed away in cold water and the newly created fabric is draped over a bowl and left to dry. The aim is to leave a little residue of stabilizer your work so it will stiffen and retain its shape when dry. I gathered up various scraps and had a go, experimenting with different textures and colours. Some peices have been put to one side to be worked into future projects while others went on to become bowls. When making the bowls I found my work needed much more stiffening (maybe I didn’t leave enough residue) so I experimented with spray starch and the far cheaper option of PVA . I am a big fan of PVA and always have loads to hand, I found that soaking my work in it, before drying on the lowest heat setting in the oven for 20 mins, gave it a much firmer finish which I was happy with. One of the experimental pieces. 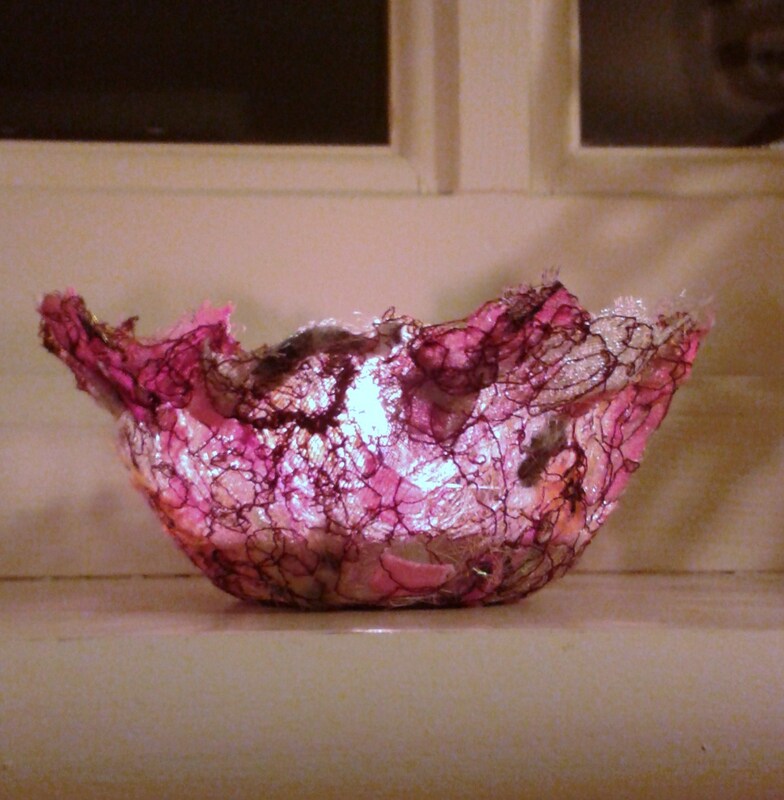 Colourful lacy bowl made from fabric scraps. So far I have made three bowls, the first was a colourful one using snippets of organza, chiffon and ribbon which looks really pretty and lacy. I put a tea light in it for the photo (above) but I wouldn’t recommend using it this way as it could pose a fire hazard! 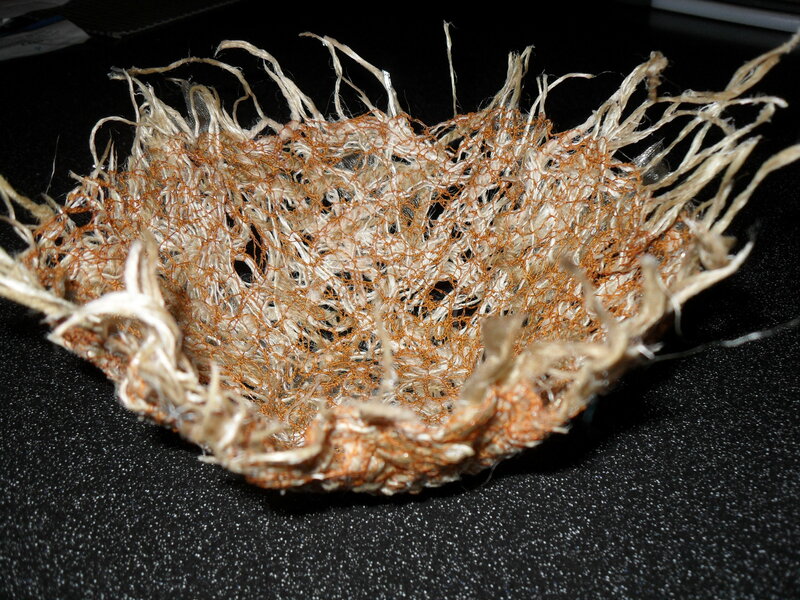 The other two bowls were both made from hessian, one in its natural state and the other bleached with Milton’s and mixed with strands of tapestry wool. I particularly like the bleached effect and, as this is the largest bowl, it has made a great bread basket. There are endless possibilities for using this technique and the great thing is that every piece will be unique. ← Away with the Fairies…. 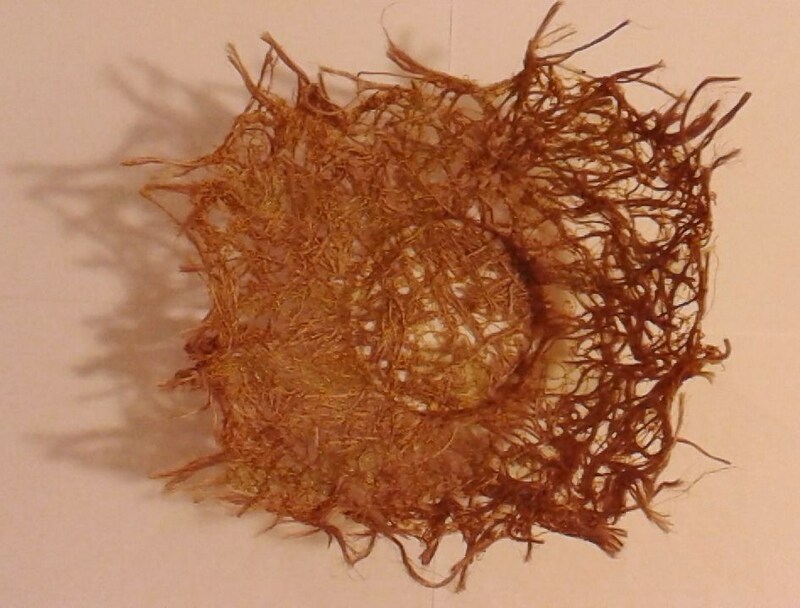 I love the bread basket, it looks a lot like hemp or flax fibre. Since making those first bowls I have bought myself an embroidery hoop and see-through stabiliser (as opposed to the one I first used which wasn’t transparent), this has made the fibes easier to work with. Your work is wonderful so I will be interested to see what you produce when you get around to doing it! I need to prioritise and have a ‘play week’ with the stabiliser and maybe some dyeing too. I don’t think I could make bowls like yours though.